Not surprisingly, I haven’t had any time to read today. Well, read for pleasure that is – I have completed school reading for about half the coming week instead. Yesterday I attended a conference on medieval stone monuments, specifically effigies, though the most interesting presentation was on the tomb testers of Edward the Black Prince and Henry IV and his wife Joan of Navarre. A tomb tester is a rectangular, flat cover, usually made of wood and highly decorated, suspended above the tomb. 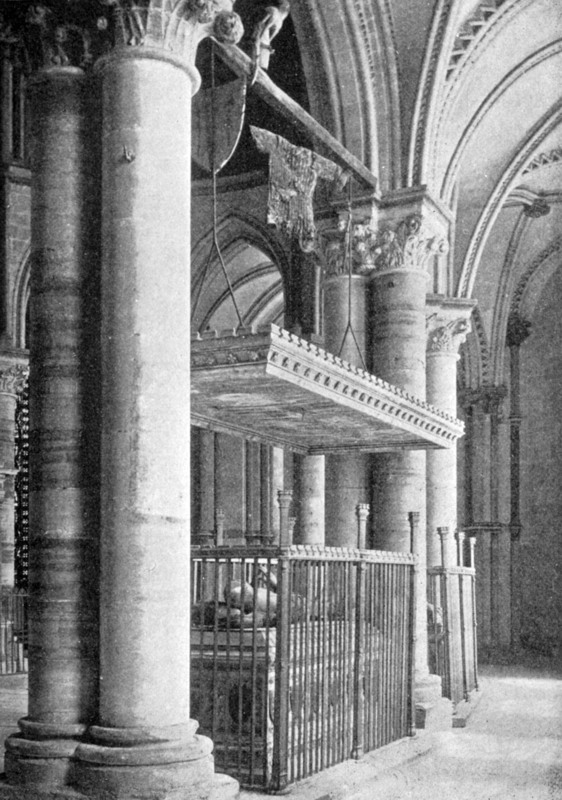 Click here to see a black and white photo of the Black Prince’s tomb; the tester is at the top below the decorations. It was very interesting to see how the paintings on and the construction of the testers demonstrated the ruling family’s wealth and piety as well as medieval methods of construction. A collective gasp went up when the speaker revealed medieval chalk marks on the Black Prince’s tester. Of course, that likely doesn’t interest all of you reading a book blog, but I felt compelled to share. It was just too exciting! So what have I been reading this week? Well, I consumed The Heretic Queen in record speed for someone in graduate school, losing sleep and actually crying at one point. This is I believe book number 4 to bring me to tears this year, out of 152 total read. Yes, it was good. Come back tomorrow for a guest post by Michelle and come again for my review and giveaway on Tuesday! I also read Life after Genius by M. Ann Jacoby, which has a blog tour stop here on the 29th, Her Only Desire by Gaelen Foley, a disappointing foray back into my romance-reading past, and Victory of Eagles by Naomi Novik, the fifth book in an AU Napoleonic wars fantasy series. Reviews of the last two will be posted soon, either this week or early next week. I probably won’t be reading at all today in favor of getting my school reading done and doing an archaeological report on a castle/hunting lodge. I will be bringing books along the rest of this week though! Up next on my library list are The Greatest Knight by Elizabeth Chadwick, The Rose of Sebastopol by Katharine McMahon, and The Enchantress of Florence by Salman Rushdie. I also hope to finish off Passions and Tempers this week (sorry for taking so long to read and review it, Jennifer!) and get to a review book, Natural Talent by Sheelagh White. I do have to say, though, that if one of my copies of Brandon Sanderson’s The Hero of Ages arrives, I will drop everything and read that next. Now I find the tomb information extremely interesting. What was the purpose of a tester? I loved reading The Heretic Queen too! It sounds like you are very busy, but it sounds like a fun way to keep busy. The conference you attended yesterday sounds fascinating–not boring at all! I am glad to hear you enjoyed The Heretic Queen so much. I am looking forward to reading that one myself one of these days. I look forward to reading the author’s guest post tomorrow. Have a great week, Meghan! At the conference they said that tomb testers originate from the original deathbed. Basically, if you were dying, there was a special bed where you’d be placed to die, and on the tester were images of God and the trinity and other religious imagery. I don’t know if this is true as I haven’t researched or heard this independently myself, it was just what was said yesterday as someone asked the exact same question! A natural extension of that is the tomb tester, so the deceased could in theory gaze up at God forever. It makes sense even without the deathbed theory though, doesn’t it? There used to be many more testers, we can see in drawings, but there are very few surviving now. It’s been fun so far! I’m glad I’m still managing to fit in some reading. Wendy, I hope you enjoy The Heretic Queen like Alyce and I did! I will be interested to hear what you think of The Rose of Sebastopol. I read it earlier this year and thought it was a bit flat, but I am surprised that there isn’t more fiction written with that setting. Surely Florence Nightingale must be famous enought and interesting enough to have more books written about her nurses and also the Crimean war. The tomb testers sound fascinating! Every time you write about your studies, my jealousy goes up another notch. I’m looking forward to your review of Victory of Eagles. I’ve got it on tap for next week too. The Rose of Sebastopol sounds really good. Is it released already in the UK? Wow, that is so cool about the tomb tester! Believe it or not, I’m a medieval geek, too, so I can appreciate that. I have The Greatest Knight on my bookshelf to read–it’s been praised to no end by several people, so I really need to get to it soon. I read The Rose of Sebastopol a while ago and was quite lukewarm about it. You are a reading machine. I have Nefertiti and The Heretic Queen in my TBR pile. I think I’m just going to have to make time to read them. Sounds like you are having a good time so far! I would be fascinated to be steeped in the history, too. How do you ever find time to sleep between reading for school & reading for fun? The Heretic Queen was great, I’ll be so interested to read your interview with Michelle and your review! I think I will have to get a copy of the Heretic Queen. I read so many positive reviews for it that it makes me want to read it.